국보 제159호 무령왕 금제 뒤꽂이(2014년 국보 동산 앱사진). 공주시 무령왕릉에서 발견된 백제 때 금으로 만든 뒤꽂이 일종의 머리 장신구이다. 무령왕릉 나무널(목관) 안 왕의 머리에서 발견되었으며, 길이는 18.4㎝, 상단의 폭은 6.8㎝이다. 위가 넓고 아래가 좁은 역삼각형 모양이며, 밑은 세가닥의 핀 모양을 이루고 있어 머리에 꽂았던 것으로 보인다. 역삼각형의 윗부분은 새가 날개를 펼치고 있는 모습이고, 3가닥으로 갈라진 꽂이 부분은 긴 꼬리처럼 되어 있어 마치 날고 있는 새의 모습을 하고 있다. 양 날개쪽 좌우에는 꽃무늬를 도드라지게 찍었고, 그 아래는 서로 대칭으로 덩굴무늬를 빈틈없이 메꿔 놓았다. 새의 머리와 날개 부분의 테두리는 끌 끝으로 찍은 작은 점들이 열지어 있다. 여기서 사용된 문양은 모두 뒤에서 두들겨 솟아 나오게 한 타출법(打出法)을 사용하였고 ,세부 표현에는 선으로 새기는 방법을 사용하기도 하였다. 왕의 머리부분에서 발견되었고, 끝이 3개로 갈라진 점으로 보아 의례 때 쓰인 머리 장식품으로 보인다. 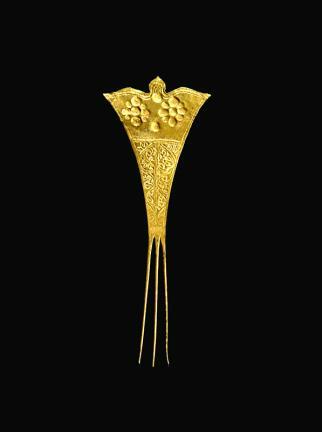 This is a gold chignon pin discovered on the head of King Muryeong’s wooden coffin at the time of the excavation of the Royal Tomb of King Muryeong. It is 18.4cm long with a 6.8cm wide upper part. It has the shape of an inverted triangle with a wide upper part and narrow lower part. Considering its 3 long pin-shaped bottom ends, it is believed to have been fixed in the hair. The upper part of the inverted triangle has the shape of a bird with its wings expanded, and the 3 sticks on the bottom look like long tails of a bird. Overall, the pin takes the shape of a flying bird. Flower patterns are printed on both the right and left wings. Vine patterns are densely and symmetrically placed under the flower patterns. The edge of the bird's head and wing is decorated with a line of many small chiseled dots. The patterns on the chignon ornament are all depicted by the tachul method, making embossed patterns on a plate by hitting the backside of the plate. Carved lines are also used for details. Considering the 3 strips on the bottom, it was supposedly used as a hair ornament for special rituals.